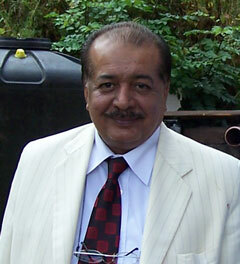 Dr Iftikhar Waris is a highly respected homeopath in Lahore. Many of the people that came to his clinics were suffering from the direct effects of agricultural chemicals, and he was convinced that many others suffered indirectly from eating the food. The 'maintaining cause' was the way the food was grown, so it was this that needed to be addressed. In the late 1990's he began addressing the problems that beset plants, and like others he worked via analogy with humans from the extensive existing materia medica for humans (and for which Dr Waris has a prodigious memory): if a plant has worms in its pathology it may benefit from Cina, etc. He also worked carefully with the potencies of the remedies by working through the publications of the less well known old homeopaths. It is his conviction that the potencies are the crucial factor in success and he does not stick to the usual 6x, 30C, 200C, 1M. He addressed the issues around him - Pakistan is primarily an agricutural country. The major crops are wheat and cotton. Over the years he has worked through the Pakistani regulatory process and had his formulations tested in field trials by NIAB, the Plant Protection Research Institute, and the Cotton Research Institute in trials with controls and the usual chemical preparations. His results are really very impressive and it is no surprise that the authorities gave the green light for his formulations to be made available on the market. Of course you can find those results in Considera's materia medica for his preparations Ventage, Black Warrant and Rigorous. It grieves me to report that Dr Waris died in October 2014. Dr Waris was unfailingly kind and helpful to me, despite the many calls upon his time. He had two clinics in Lahore, his pharmacy, his newspaper and periodical commitments, his work with children with special needs, and the demands from those for whom his lineage inspired devotion. His work with plants was just one of the many inspirations he bought to fruition in the world. I will miss his occasional journeys to the UK where he would look after his 'little brother' with unfailing tact and humour. Travel well Dr Waris. I will imagine you carrying on your weighty debates with Kaviraj in a heaven so much more comprehensive than our earthly labels might divide.